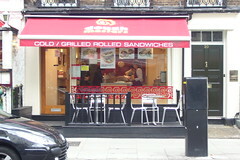 A takeaway sandwich shop in Fitzrovia, which has two other branches in Croydon. There are certainly no shortage of sandwich shops in Fitzrovia, but this one is keen to set itself apart by its "rolled sandwiches" (a wrap, in other words) using bread freshly made on the premises and cooked in little ovens they keep out on the counter (the website provides further fanciful praise). Entering the shop, you are asked what sandwich you want, and then you pay at a till up the back of the shop while the sandwich is made. There is no space to eat in. The bread they use certainly is different from the standard run of sandwich shops around these parts - thin, flat and doughy - and could be the highlight of their sandwiches. However, Doughmasters also do a good range of fillings with plenty of vegetarian options (sandwiches with spinach or aubergine, stuffed vine leaves, Mexican beans, vegetarian sausage, et al.). My Mexican beans, cheese and lettuce was tasty, mildly spicy, and not overloaded with cheese. On another visit in April 2008, I went for the vegetarian sausage, spinach and cheese option. The sausage itself was fairly bland quorn-related product, with only a spiciness to redeem it. However, the rest of the sandwich was still good, and the bread excellent. Doughmasters is a good option for a lunchtime sandwich in an already saturated market. Last visited by Ewan, April 2008. Last edited 2019-02-05 10:47:15 (version 6; diff). List all versions. Page last edited 2019-02-05 10:47:15 (version 6).